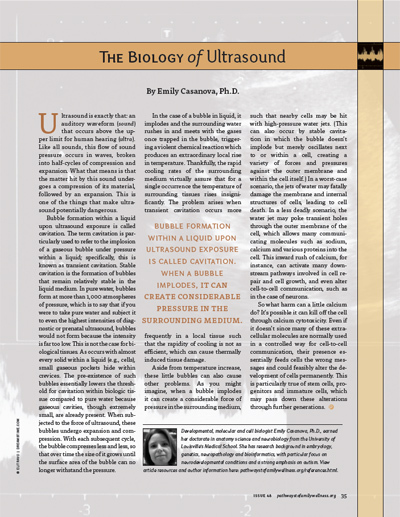 Author // Emily Casanova, Ph.D.
Labels: Pregnancy & Birth, Issue #48, Author Emily Casanova, Ph.D.
Ultrasound is exactly that: an auditory waveform ( sound ) that occurs above the upper limit for human hearing ( ultra ). Like all sounds, this flow of sound pressure occurs in waves, broken into half-cycles of compression and expansion. What that means is that the matter hit by this sound undergoes a compression of its material, followed by an expansion. This is one of the things that make ultrasound potentially dangerous. Bubble formation within a liquid upon ultrasound exposure is called cavitation. The term cavitation is particularly used to refer to the implosion of a gaseous bubble under pressure within a liquid; specifically, this is known as transient cavitation. Stable cavitation is the formation of bubbles that remain relatively stable in the liquid medium. In pure water, bubbles form at more than 1,000 atmospheres of pressure, which is to say that if you were to take pure water and subject it to even the highest intensities of diagnostic or prenatal ultrasound, bubbles would not form because the intensity is far too low. This is not the case for biological tissues. As occurs with almost every solid within a liquid (e.g., cells), small gaseous pockets hide within crevices. The pre-existence of such bubbles essentially lowers the threshold for cavitation within biologic tissue compared to pure water because gaseous cavities, though extremely small, are already present. When subjected to the force of ultrasound, these bubbles undergo expansion and compression. With each subsequent cycle, the bubble compresses less and less, so that over time the size of it grows until the surface area of the bubble can no longer withstand the pressure. In the case of a bubble in liquid, it implodes and the surrounding water rushes in and meets with the gases once trapped in the bubble, triggering a violent chemical reaction which produces an extraordinary local rise in temperature. Thankfully, the rapid cooling rates of the surrounding medium virtually assure that for a single occurrence the temperature of surrounding tissues rises insignificantly. The problem arises when transient cavitation occurs more frequently in a local tissue such that the rapidity of cooling is not as efficient, which can cause thermally induced tissue damage. Aside from temperature increase, these little bubbles can also cause other problems. As you might imagine, when a bubble implodes it can create a considerable force of pressure in the surrounding medium, such that nearby cells may be hit with high-pressure water jets. (This can also occur by stable cavitation in which the bubble doesn’t implode but merely oscillates next to or within a cell, creating a variety of forces and pressures against the outer membrane and within the cell itself.) In a worst-case scenario, the jets of water may fatally damage the membrane and internal structures of cells, leading to cell death. In a less deadly scenario, the water jet may poke transient holes through the outer membrane of the cell, which allows many communicating molecules such as sodium, calcium and various proteins into the cell. This inward rush of calcium, for instance, can activate many downstream pathways involved in cell repair and cell growth, and even alter cell-to-cell communication, such as in the case of neurons. So what harm can a little calcium do? It’s possible it can kill off the cell through calcium cytotoxicity. Even if it doesn’t since many of these extra-cellular molecules are normally used in a controlled way for cell-to-cell communication, their presence essentially feeds cells the wrong messages and could feasibly alter the development of cells permanently. This is particularly true of stem cells, progenitors and immature cells, which may pass down these alterations through further generations.